Fewer errors. Greater transparency. Lightning fast deployment. Take the complexity out of recording schema changes in your existing source control system. Compare and synchronise schemas. Deploy changes from source control, and automate for continuous integration. Compare table data fast and generate update scripts without writing a single line of SQL. Save time identifying differences between instances of your database. Compare schema objects and table data. There's no need to write database update scripts by hand. Avoid mistakes during deployment. Automate for continuous integration. Remove manual processes to checking database code into SVN or TFS. Track and share schema changes easily. Synchronise environments using the software or save deployment scripts to review and execute in your IDE. Group objects or select individual changes. Get deployment notifications about dependencies, truncations, and other issues. Deploy changes from any version in source control. Checking in changes is as simple as writing a log message and clicking a button. Use the difference viewer to inspect every change before you check it in. See who modified the database and why, and access a history of every change. 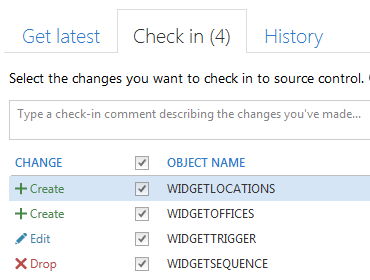 Compare your database to past revisions in source control. Automate scheduled tasks like comparisons and deployments. Include in your build system for continuous integration. (you'll also need the SQL Automation Pack).